At the other end of the price spectrum, Toyota's also introducing an all-new 2012 Yaris, with big improvements to the interior and the dashboard, both of which came in for criticism. The interior has an upgraded appearance and materials look more substantial overall, while the dashboard has a more conventional appearance instead of the off center gauges which some car writers and prospective customers criticized. Both three-door and five-door models are powered by a 1.5-liter, 16-valve, four-cylinder DOHC engine equipped with variable valve timing with intelligence (VVT-i), producing 106 hp at 6,000 rpm and 103 lb.-ft. of torque at 4,200 rpm. The broad torque curve provides plenty of response for both manual transmission and automatic transmission vehicles. All Yaris L, LE and SE models are available with a new four-speed electronically controlled automatic transmission, featuring a more compact, lighter-weight design and reduced friction for greater fuel efficiency. A smooth-shifting five-speed manual transmission is available on L and SE models only. For the all-new Yaris, both the front MacPherson-strut and rear torsion-beam suspension have been tuned to deliver a better ride and improved driving feel. The front stabilizer bar has been increased to 24.2 mm (0.95 in.). Standard tire sizes are increased as well to 15-inch on L and LE versions, and 16-inch on the SE. Electric power steering provides good road feel at highway speeds while aiding low-speed parking maneuvers. The new Yaris also features nine standard airbags aboard. Standard driver and front-passenger dual-stage airbags (SRS) are complemented by front-seat mounted side airbags and a knee airbag for the driver. Roll-sensing side airbags are fitted to both front- and rear-row seats for a total of nine airbags. In common with all Toyota vehicles, the Yaris features Toyota’s Star Safety System™, which includes Vehicle Stability Control (VSC), Traction Control (TRAC), Anti-lock Braking System (ABS), Electronic Brake-Force Distribution (EBD) and Brake Assist. 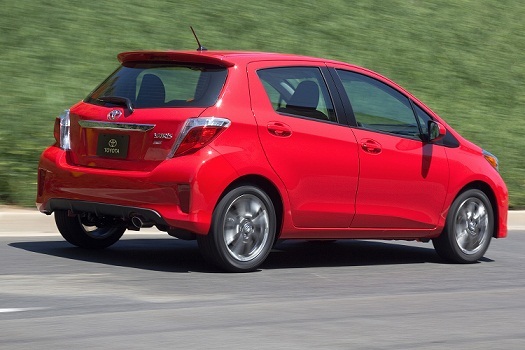 The new Yaris also features Smart Stop Technology, Toyota’s brake-override system, as standard. New to the 2012 Yaris is Toyota’s Advanced Whiplash Injury-Lessening (WIL) front-seat structure. The design helps to ensure that all areas from the head to the lower back are equally supported, helping to reduce whiplash-type injuries during certain types of collisions. The new Yaris features an impact-absorbing body structure utilizing high-tensile strength steel to effectively distribute collision forces. For the first time, Toyota has engineered a single-windshield wiper with wet-arm system for reduced weight and better performance. The system sprays washer fluid from the base of the wiper arm directly in the path of the blade for improved cleaning and wiping action. Starting with the Yaris L, all models include standard electric power steering, power-assisted ventilated front disc brakes, power door locks and Cold Weather Package. Other standard features include air conditioning, six cup and bottle holders, and storage cover for the cargo area. Halogen headlamps and intermittent front windshield wiper are also standard. All models also feature full audio connectivity via USB and auxiliary ports, along with a standard AM/FM/CD player with MP3 and WMA playback compatibility. LE and SE models feature an audio system with HD radio, six speakers and Bluetooth music streaming technology. The Yaris LE includes standard power windows with driver’s auto-down, power mirrors, and a remote keyless entry system with Engine Immobilizer. The steering wheel features audio controls, and cruise control is available as an option on the LE. The design of the 2012 Yaris is longer and lower, with a longer wheelbase, with a protruding front profile with wide headlamps and integrated turn signals.The side profile displays a steeply sloped beltline, and flowing curves that appear to stretch the image of the vehicle. 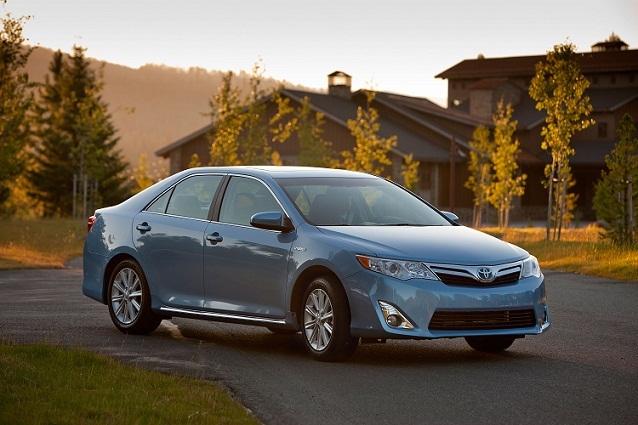 The shoulder lines continue around to the rear, creating a sharp, solid look, Toyota says in its news releases. Eight colors are available for the new Yaris, including Super White, Classic Silver Metallic, Magnetic Gray Metallic, Black Sand Pearl, Absolutely Red, Lagoon Blue Mica, Wave Line Pearl and Blazing Blue Pearl. "The interior has been completely redesigned on the new Yaris, providing a level of detail not often seen on cars in this price class," a Toyota release says. " The doors close with a smooth, solid feel. Additional sound-absorbing and insulating materials make for a quieter ride. Upgraded fabrics and soft-touch dash highlight a more premium, sporty interior. The front seats are now wider, and sculpted to reduce fatigue on long trips." "The driver experience is heightened with a new tilt three-spoke steering wheel, featuring a thicker grip and a flat-bottom shape to reduce knee interference. 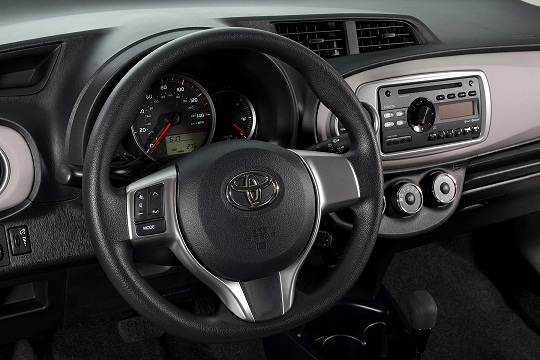 The instrument cluster, center-mounted in the previous Yaris, is relocated in front of the driver and includes a multi-instrument display with odometer, twin trip meters, clock, outside temperature reading, fuel economy display, average speed and Eco-Driving indicator." Yaris L models feature a one-piece folding rear seat, while LE and SE editions include a 60/40 split fold-down rear seat. The luggage compartment area has been lengthened by 5.7 inches, and widened by 2.1 inches, to increase cargo volume by 64 percent in the 3-door and 68 percent in the 5-door. Cargo capacity with the seat up is 15.3 cu. ft. on the 3-door and 15.6 cu. ft. on the 5-door. The Yaris SE has a sport-tuned suspension, quicker ratio steering, more aggressive styling and driver-oriented interior. The SE features both front and rear disc brakes, with the front disc nearly an inch larger in diameter than L and LE versions. The SE is equipped with P195/50R16 tires and alloy wheels. The SE features smoke-trim multi-reflector halogen headlamps, integrated fog lamps and color-keyed grille with sport mesh insert. It also features color-keyed front and rear underbody spoilers, rear spoiler and rear diffuser, set off by a chrome exhaust tip and SE badge. Inside, a sporty instrumentation package faces the driver, with an analog speedometer, tachometer, fuel gauge, and digital Multi-Instrument Display. The leather-trimmed tilt three-spoke steering wheel includes audio controls and standard cruise control. Exclusive sport seats help add shoulder-level support for more comfort and control. The Yaris SE also includes a six-way adjustable driver’s seat and four-way adjustable passenger seat with sport fabric trim. Pricing for the all-new 2012 Yaris will be comparable to a previous-generation Yaris with the Convenience Package, with prices of most grades remaining unchanged, making the all-new and improved model a great value versus the previous model. The base MSRP will range from $14,115 for the L grade three-door liftback with a five-speed manual transmission to $17,200 for the SE grade five-door liftback with a four-speed automatic transmission. 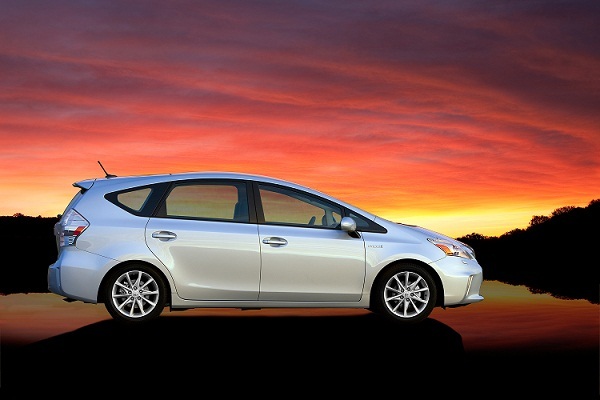 Is the new Prius V the first hybrid compact station wagon? Toyota says the new Prius v, with “v” expressing the vehicle’s versatility, will "meet the needs of growing families with active lifestyles while providing the same attributes traditionally found in the Prius DNA. It will share the current generation Prius’ platform and Hybrid Synergy Drive technology. Featuring a compact exterior yet spacious interior, the Prius v will feature over 50-percent more interior cargo space than the current Prius." The exterior styling, the news release says, " is sleek, rounded and bold, with an extended roofline that allows the vehicle to retain the triangular silhouette symbolic of Prius. 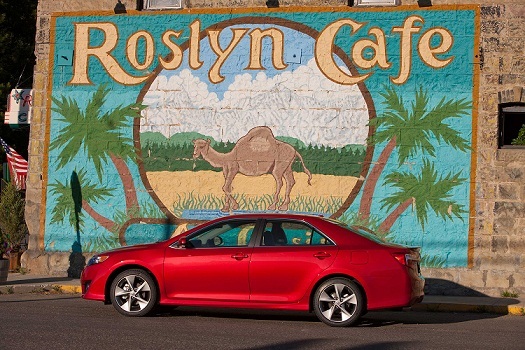 The trapezoidal-shaped front features sharp-edged headlamps, wind-slipping aero corners for improved aerodynamics and an enlarged under grille, which all help create a unique design evolving from the current Prius. Prius v’s rear styling is highlighted by a refined backdoor panel, intricate combination taillights and a specially designed roof spoiler that improves air flow." "Inside, the Prius v emphasizes overall proportion with spaciousness and flexibility for active families. Comfortable interior space and good visibility has been assisted by a high seating position, ample head room, and an impressive 38-inch couple distance, providing generous rear legroom. A low, wide-opening rear hatch reveals 34.3 cubic feet of cargo space behind the rear seats, making it the most spacious dedicated hybrid vehicle on the market and better than some compact SUVs," the release adds. There's room for five, and there are sliding second row seats to make it easier to get in and out of the car. It also includes a 45-degree recline in the second row for greater comfort. The 60/40 split, folding rear seats present four different seat arrangements that provide excellent usability for passengers and luggage, while a fold-flat front-passenger seat allows for extremely long cargo. Also available, and a Toyota-first, is a resin Panoramic View moonroof with power retractable sun shades that provides an open atmosphere in the cabin with a 40-percent reduction in weight as compared to conventional glass roofs of the same size, and heat insulation performance. Up front, instrument-panel controls, including a single-dial air-conditioning control and a center-mounted digital combination meter, provide an advanced look and user-friendly command. The driving controls – including the Push Button Start, parking switch, electronic shift lever, and driving mode selection – are distinguished by silver trim. Toyota promises that the Prius v will deliver estimated EPA fuel economy ratings of 42 mpg city, 38 mpg highway and 40 mpg combined, the best fuel economy ratings of any SUV, crossover, or wagon on the market. It will also emit 66-percent fewer smog-forming emissions than the average new vehicle. Four driving modes (Normal, Power, Eco and EV) satisfy a variety of road conditions and driver preferences. A Smart Key System with Push Button Start, an electronic shift lever, Hill Start Assist Control (HAC), and a back-up camera are standard. Available options include energy-efficient LED headlamps, Dynamic Radar Cruise Control with a Pre-Collision System (PCS), and Advanced Parking Guidance System. For a high level of safety, there are seven airbags, a high-strength cabin and an energy-absorbing body structure with impact beams, cross members and leg absorption pads. New driver and front-passenger seat design helps lessen possible whiplash injury during a collision. Prius v will be one of the first Toyotas with the Entune™ multimedia system. For the first time ever in an automobile, the system leverages the mobile phone to provide a richer in-vehicle experience with fully integrated and wireless upgradeable navigation, entertainment and information services. Toyota Entune debuts the first-ever support for engaging mobile apps, such as Bing, OpenTable, and movietickets.com, along with accessing useful travel-related services, such as live weather, traffic, fuel information (location and price), stocks, news and sports. Toyota Entune brings the largest selection of music options available to a vehicle, including iheartradio’s 750+ stations, Pandora’s personalized music, the driver’s personal songs from portable media players and iPods (via USB or Bluetooth audio streaming), and more than 170 stations from XM satellite radio. Featuring a best-in-class, advanced conversational voice recognition system that helps the driver to stay focused on the road, Toyota Entune eliminates the need to memorize thousands of voice commands and helps reduce driver distraction. Prius v will combine Entune with a standard Display Audio system which will include HD Radio with iTunes tagging for future purchase; XM radio, weather, sports, stocks and local fuel pricing; Bluetooth hands-free phone and wireless audio; and full iPod integration including music and video. A new evolution in hybrid vehicles with excellent cargo space and Prius’ heritage of environmental performance and fuel economy, the 2012 Prius v will go on sale in late summer 2011.